A fascinating report from Barclays Capital is shedding some light on what's known as "performance persistence" in hedge funds. If a hedge fund had a great year, what's the likelihood that its performance will be above average next year? Alternatively if a fund had a terrible year, what should the expectation be for the following year? Another way to ask the question is whether hedge fund performance could be modeled as a "martingale" with each year's performance completely independent from the previous year (similar to the way a stock price would be modeled). It turns out that hedge fund performance in a particular year is very much dependent on how that manager did the previous year. The two charts below compare how funds in the lowest (Q1) and the highest (Q4) one year performance quartile fare over the the following year. 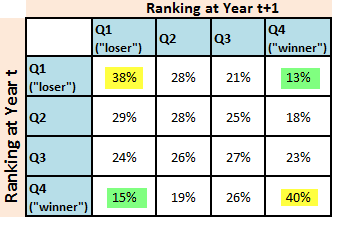 With no exceptions the "losers" in year one performed below the mean in year two and the "winners" performed above the median. This is true for each year since 1997 and for all major strategies. What this means is that the "losers" (poor performers) are much more likely to be stuck being "losers", while the "winners" will probably continue to do well. The table below is a transition matrix, showing the frequency of funds moving from one quartile to another or staying in the same quartile from one year (t) to the next (t+1). 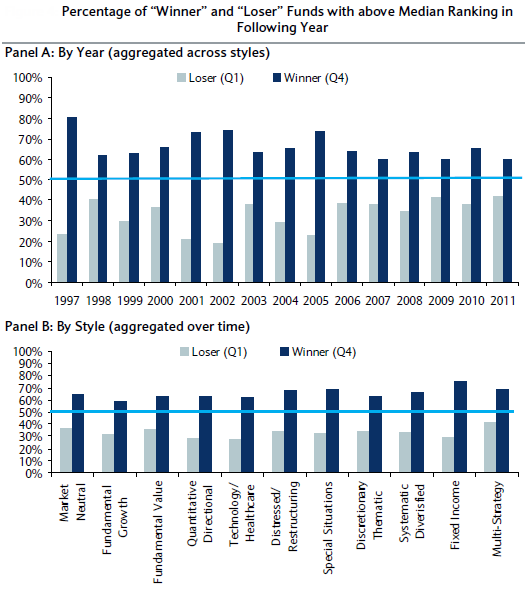 A loser has only a 13% chance of being a winner the following year and a 38% chance being a loser. The result for the winners is very similar. Hedge funds that had either a very good or a very bad year are in effect "trapped" in their performance bucket. 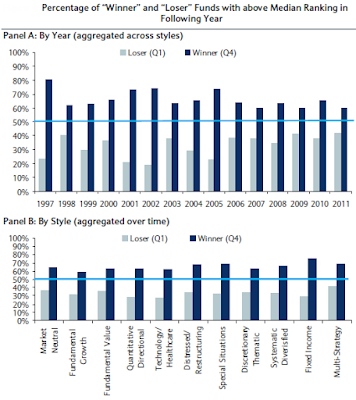 This explains why when hedge funds have severe underperformance relative to their peers, redemptions kick in quickly. Investors don't want another bad year and know that it is in fact the most likely outcome. The opposite is true for funds who had an exceptional year. Value stock investors often look to invest in stocks that underperfomed their peers in hope that these stocks would bounce back next time, outperforming peers. But here is the lesson from the "performance persistence" study: unlike value stocks, loser hedge funds are likely to stay that way.